Luckily, after their tremendously successful maiden voyage in 2015, MEW are returning to showcase their extensive back catalogue and their new album Visuals. Presented by The Music, Bird’s Robe & Australian Mew fan community Mewstralia, the tour will take place in September 2017. Tickets are on sale now at Oztix and birdsrobe.com. Melbourne’s progressive rock powerhouses with a penchant for creating iconic melodies, Closure in Moscow, are joining the tour for all dates. 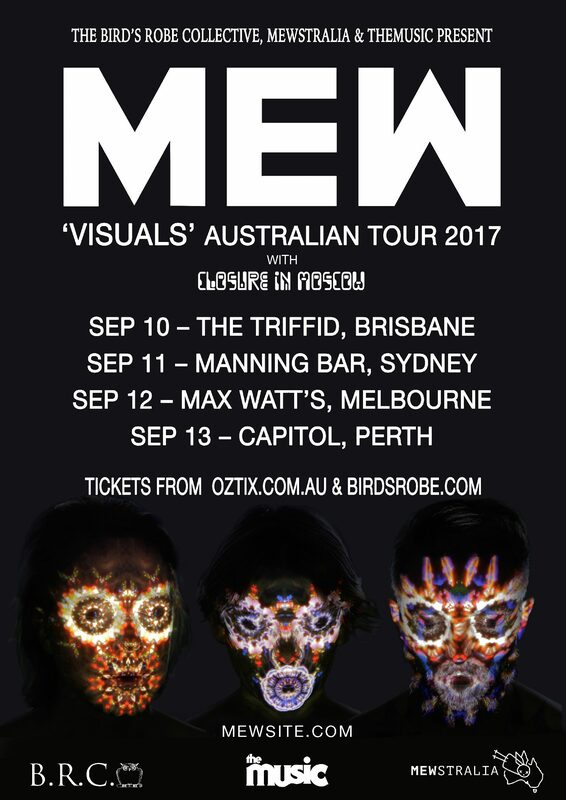 The tour hits Brisbane (September 10 at The Triffid), Sydney (September 11 at Manning Bar) and Melbourne (September 12 at Max Watt’s), but for the first time ever, MEW will be venturing to Perth (September 13 at Capitol). It will also mark Closure in Moscow‘s first Perth show in over four years. Closure in Moscow‘s debut record ‘First Temple‘ saw them signed to Equal Vision records and tour extensively with the likes of Coheed and Cambria, Dead Letter Circus, My Chemical Romance, Dance Gavin Dance, Fact & Emery. Temporarily relocating to Portland, Oregon the band repeatedly toured the US, including the Vans Warped Tour, before returning home on the back of high rotation on triple j radio to headline their own shows. Further Australian, UK, Europe and Japan touring followed before the eventual release of ‘Pink Lemonade’ – a cathartic experimental concept record which has cemented their cult status as unpredictable musical chameleons. In 2017, the band are deep into pre-production for their much anticipated third album and this September they will join prog-pop legends MEW for four exclusive shows in Brisbane, Sydney, Melbourne and Perth. Closure in Moscow will be premiering new material live for the first time!